When I started my new job, I had the idea to rebrand this blog. A lot of the ideas I had for entries seemed to focus more on my family than on vague philosophies about finding The Way. About a month ago I even changed the format and added a header. And a few days ago I thought about creating a completely new blog, with a new URL and everything. I have no idea if I’m going to do anything with this place, or just continue to use it for those times when I have thoughts I manage to string together in a marginally coherent fashion. Either way, I needed a change. And while I originally thought I’d write a post on the idea of branding, and what it means from a personal standpoint (and not, I might add, a flatiron standpoint), and then, as the new year approached, thought I might write on the new year (though not, perhaps, as optimistically as I did three years ago). But instead I want to write about Kairi, and the end of a journey. I always planned to breastfeed. I have nothing against formula-feeding moms and know that for many, formula is the reason their babies are still here. Or the reason that mom’s sanity is still here. Or some combination of the two. But for me, breastfeeding was just what you *did,* and as long as I had milk and Kairi wasn’t born with anything that would have prevented her from being able to latch, she would nurse. This isn’t necessarily a post about our breastfeeding journey, because we really were very lucky in terms of that. She latched for the first time about 30 minutes after birth, and never looked back. I hated pumping but managed it well enough to keep her fed while I was a work, and while I had a pretty severe dip in supply when she was about 3 months old, from a combination of travelling, me getting sick, and going back to work full time, once I got that under control we were fine. I even had some frozen milk leftover I was able to donate to another mama after Kairi’s first birthday. The hardest part of nursing for us, was that she wanted to nurse All. The. Time., and in short sessions, which made it hard to do anything when I was home, and ensured she woke up multiple times a night to nurse. And because she loved nursing so much, she loved sticking her hand down my shirt and twiddling (if you’re not sure what that is, it’s exactly what it sounds like and just as annoying). There were a lot of frustrations on my part, but not a lot of actual difficulty. By the time I started travelling overnight for work, we were down to one nursing session per day, at bedtime, and only on the nights I was home. My supply dropped, and dropped. And around Thanksgiving, she was losing interest in nursing at night entirely, so I decided I would pick a day that would be The Last Day, so I wouldn’t miss it. 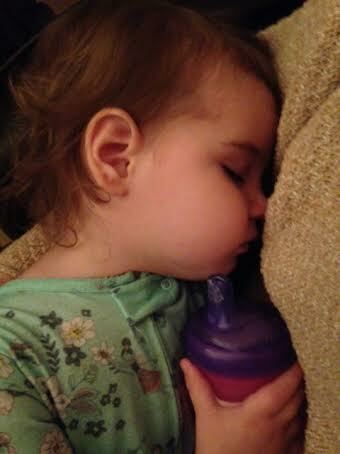 And I had a few days in mind–Christmas, New Year’s, or her 18 month birthday (which, spoiler alert, was today). Then Christmas came, and she got sick and wanted to nurse more. And last week she was mostly better, but still very determined to go back to her old habits, and between being sick and getting her molars, bedtime in general was being a nightmarish (see what I did there?) experience, and not the way either of us needed to say goodbye to nursing. And then…tonight. I brought my phone upstairs on a whim, since I didn’t feel like going into the bedroom to grab my book. Bedtime was way too late and I expected a battle and figuring I wouldn’t get much reading in, anyway. We sat down. She lifted my shirt, and smiled at me before latching on. And for the first few minutes, she went back and forth between the breast and her sippy cup (again–almost no supply anymore), and at one point tried to put both in her mouth at the same time. And eventually gave up and just…nursed. 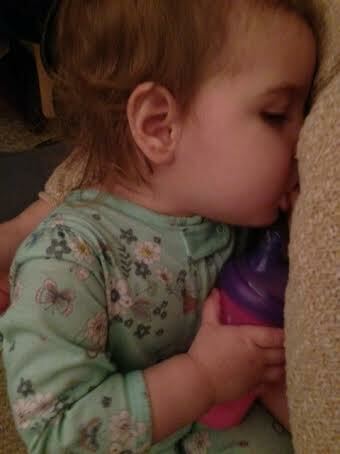 She popped off one more time to drink from her sippy cup and I switched her to the other side, and she nursed–comfort nursed, rather–with her eyes half-closed and that perfect, peaceful look babies have as they are drifting off, until she fell asleep at the breast and let her head drop beside me. So my rebranding isn’t about my blog, or what I want people to think of when they see me, or even what I want out of the new year. It’s about me and my daughter. And that for the first time since she was conceived, we now exist entirely as two separate people. Tomorrow I’ll wake up and drive to Lynchburg, and she’ll wake up, fully 18 months old, with no idea that anything is different. And while nothing will *really* change from this, we both had one last, beautiful moment as one.